We will scrutinize your history of claims to identify areas for potential cost relief or cost removal. We ensure that all costs associated with a claim are directly related to the injury or illness sustained. When a discrepancy is found, we determine the best course of action related to the circumstances and proceed on your behalf accordingly. Since this service is offered on a contingency fee basis, there is absolutely no cost to the employer unless and until we are successful in achieving premium savings. The BCL team will prepare submissions and represent an employer’s interests at all levels of appeal or review, utilizing relevant information, policies and practices. Our commitment is to ensure the employer’s rights are upheld, based on the rules of natural justice and administrative fairness. It would be nice if all decisions made on a claim were accurate and fair, but we know that this is not always the case, and that the appeals or review process can be complex and time consuming. Based on overall operations, employers are assigned an industry classification and then assessed an applicable rate for that industry. As there is a wide variance in industry rates and descriptions, classification errors can be very costly. We will review your WCB Industry Classification and rate calculation to ensure that your organization is classified correctly and that your rate is accurate. This review will ensure that you are paying the lowest rate possible. We take a proactive approach to providing effective cost control by managing all aspects of a claim, whether it is expediting medical appointments or treatment programs, gathering vital information for decision making, assisting with identifying return work options or vocational rehabilitation involvement. We know the key to effective claims management is not only early intervention but understanding the claims process, where we can put our experience and expertise to work for your organization. In 2008 the WCB introduced Industry Custom Pricing (ICP) as a Pilot program to the Auto Dealers Industry, which eliminated Cost Relief on claims where a pre-existing condition was identified. 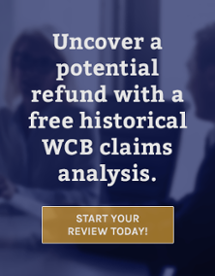 This program was carried over to employers in other industries, where the WCB offered a small reduction in premiums to employers in return for giving up the right to cost relief on any claim. BCL can break down the benefits and risks of participating in ICP and ICP-CR to help determine if participation is the right option for your organization.